Bean sprouts has a crunchy and nutty flavor. They are rich in vitamins, minerals, amino acids, protein and phytochemicals. 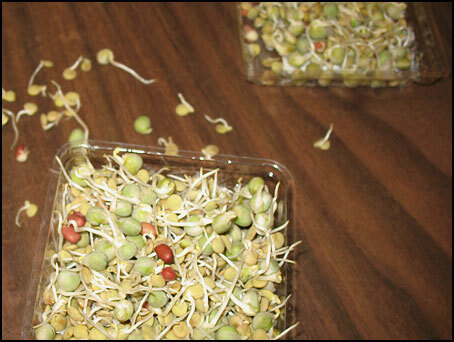 Usually I add these sprouts in salads which give a nice crunchy taste. But due to the recent outbreaks of salmonella, or Escherichia coli I started cooking them in high heat so it will at least kill the bacteria to some extent. Add water and salt and bring to a rolling boil. (When adding water to the roasted quinoa, it might splatter since the pan is quite hot). Chop bell pepper, squash, and mushrooms into thick sliced. Add oil to a skillet and add ginger and fry for about a minute. Add red onion and sauté until lightly transparent. 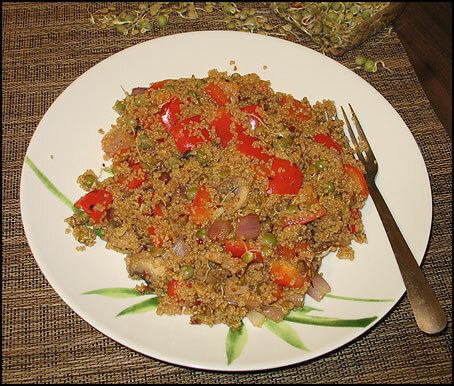 Transfer cooked quinoa to the skillet and mix well. Roast cashew nuts and sprinkle on the top and mix into the quinoa. Note: you can use any vegetables you want for this dish. For example snow peas or sugar snap peas can be another option (I did not have those). If you are non vegetarian, you may want to try a bit of fried shrimp on the top.